Literally life changing! This programme revealed problems I didn’t realise were there and that were holding me back. It gave me confidence and a positive approach to change aspects of my working life. 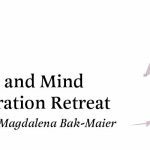 I really enjoyed Magdalena’s way of presenting thought-provoking ideas, the interactive elements and the variety involved as well as her realistic and gentle approach to change.